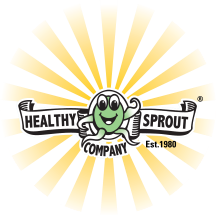 A sprout from olive coloured, small green beans, they have a creamy white flesh and a soft olive coloured coating. 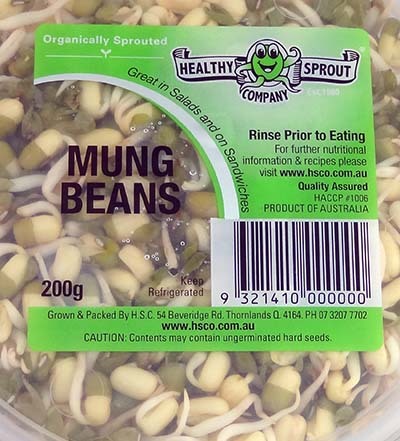 Mung Beans contain significant levels vitamin A, BI, B2 and C, calcium, iron and niacin. They are high in fibre and are beneficial in countering protein deficiencies because they are fibre high. 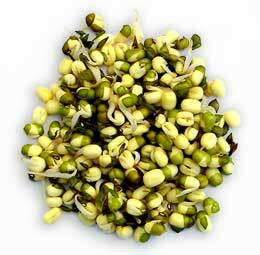 These are ideal sprouts for stir-frying, and can also be served raw . In Asia they use ingredients such as garlic, ginger, spring onions, or pieces of salted dried fish to add flavou r to a mung bean sprout stir fry dish. Over medium-high heat stir-fry the broccoli in oil for 1 minutes. Add 1/2 cup water and stir-fry for another 2 minutes. 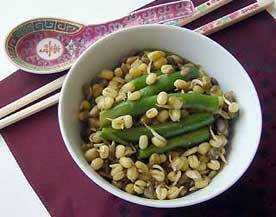 Add bean sprouts and sunflower seeds. Stir-fry for another 2 minutes. Dissolve cornflour in 1/2 cup water. Add to broccoli and sprout mixture along with soy sauce and sesame oil. Stir, then cover for 1 minute. Serve hot. Sunflower seeds could be replaced with pine nuts or slivered almonds.